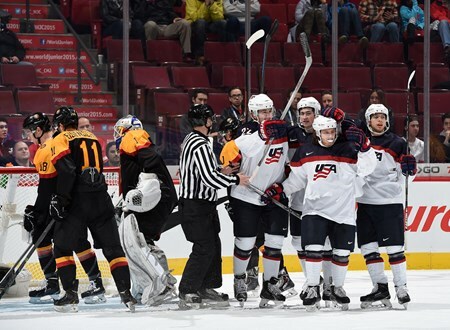 Jack Eichel showed why he’s a projected top pick in the 2015 draft scoring a highlight real goal and the United States defeated Germany 6-0 in their second tournament game. Dylan Larkin, the Red Wings prospect scored twice and individual tallies also came from Hudson Fasching, Sonny Milano and Auston Matthews. With 53 shots on goal, the U.S showed why they’re one of the favorites to win the tournament. Leon Draisaitl not being released by the Edmonton Oilers caused the German team to lack guidance and star power. U.S. goaltender Brandon Halverson was rarely tested but stopped all 14 shots he faced in the contest. In a dominating performance, the U.S surprisingly went 0 for 7 with the man advantage. Ilja Sharipov made 47 saves and was the only reason this game didn’t get completely out of hand.